What is the trend in 2019 for interior furniture? Designer decor, in-vogue materials, fashionable colours, this is how to re-do your interior according to the latest decor trends. This year, mixing styles is in the spotlight, with a growth in vintage furniture. There is a big return to cane. This traditional technique of weaving rattan fibres shows up in Art Deco or retro bohemian interiors. Chairs and armchairs, designer lamps, and also high tables and wicker furniture which bring a touch of authenticity without being as imposing as solid wood furniture. They bring a harmonious counterbalance to darker shades such as a cherry wood cupboard or a walnut sideboard. The natural fibres are also increasingly inviting. Sofas and armchairs, table and chair sets or side tables made from bamboo, straw, willow, rope, seagrass, wood or jute are visible all over the house, in the living room, kitchen and bedroom. The lighter shades have the advantage of providing a sense of space, particularly welcome in small areas. With respect for the environment being more and more noticeable in our everyday lives, interior decoration naturally follows our concerns. 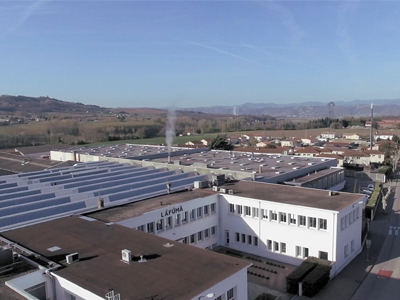 Contemporary furniture proves to be durable, designed with ecology in mind, made in France with high-quality materials such as is seen in the furniture collection from LAFUMA Mobilier. 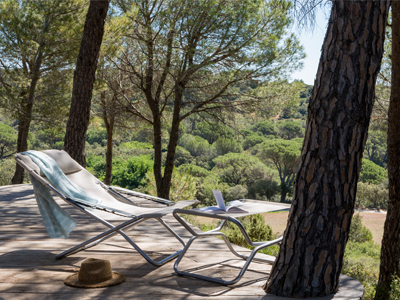 With the lounge chair, environmentally responsible aesthetics combines with optimum comfort. The natural materials such as linen and also corduroy which saw its peak in the 1970s are increasingly seen; both soft and comforting, they bring a touch of warmth to interiors. Available in various colours, smooth or ribbed, corduroy is taking over cushions, blankets and sofa covers. But the main new innovation remains the appearance of the natural world. The lines between indoor and outdoor have become blurred. Nature is reasserting itself in living spaces with the fashion for terrarium or planted frames. Perfect for space-saving, a vertical garden with hanging plants has increasingly moved indoors, particularly among city dwellers. Decorative objects with dried flowers sit alongside candlesticks and vases on shelving. Upholstery evokes a luxuriant forest. Decor shows itself to be bucolic, light and minimalist. Natural light needs to be present in any space. 2019 sees the return of display case furniture. Books, beautiful china and decorative objects are on display on library shelving or in an open cupboard, just like a cabinet of curiosities. Outdoor space takes on an increasingly important role. The garden becomes a true part of the house. As soon as good weather arrives, the living room moves to the patio, which needs to be a simple, pleasant space to be in. Outdoor furniture combines practicality, strength and style, with a designer chair which guarantees comfort in seating, together with its matching low patio table for those leisure moments. As for the relax chair it offers a true moment of relaxation with a position designed to best relax the muscles and to ease breathing. 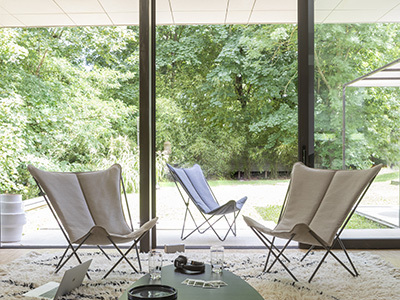 With its adjustable backrest, armrests, adjustable and removable headrest cushion and its “zero gravity” position, the relaxation chair from LAFUMA Mobilier, developed with the support of the medical profession, is ready to help with recovery. 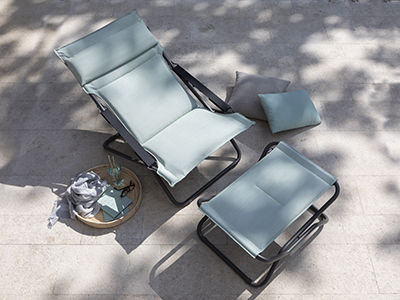 Next to the swimming pool or under the shade of a parasol, the sun bed designed for a reclined position, with its comfortable headrest and footrest, is an essential of outdoor furniture. 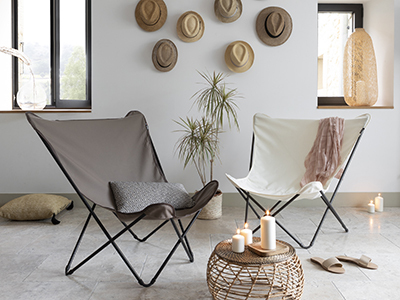 To design a calming cocoon, the balcony or patio only needs to be brightened up with light furniture such as nesting tables, a colourful outdoor rug and a designer outdoor lamp. Create an oasis of freshness with greenery on the patio with plants in pots, grasses or annuals for colour. Decorative accessories like cushions scattered around, string lights in a lantern, or a large mirror hung on the wall will all make a cosy atmosphere. What are the on-trend colours for furniture this year? Softness and nature remain the keywords. Pastel colours such as grey-white, aqua and antique rose are still popular. Purple has been showing up in light touches in trends this year. But the key shade is by far green which is available in a range of hues, from khaki to olive green. In textiles as well as with painted furniture, a few brighter, dynamic touches will enliven your space, with terracotta orange or curry yellow. A timeless colour, grey remains trendy over many years. The best idea is to play with contrasts by combining it with other more energetic colours.